Animal Bites - body, last, viral, causes, Are Animal Bites Dangerous? Animal bites are wounds caused by the teeth of a wild or domestic animal or human. Animal bites can range from mild to serious. When the skin is not broken, bites usually are not dangerous. When skin, muscles, or tendons are torn, bones are crushed, a deep hole is made (a puncture), or the wound becomes infected by germs in the saliva, then animal bites can be very serious. In these cases, a doctor should examine the wound. * mammals are warm-blooded animals with backbones, who usually have fur or hair. Female mammals secrete milk from mammary glands to feed their young. Humans are mammals. Dog bites usually occur on the hands, face, or legs. This bite is on the leg of an adult. Most dogs do not bite unless they are provoked or teased or protecting their puppies. Children should be taught always to ask permission before petting a dog and never to pet unknown dogs. Dog bites should be examined by a doctor. Infections are rare, but if they do occur, they usually cause redness, swelling, and tenderness around the wound site. © 1995 Dr. P.Marazzi/Science Photo Library, Custom Medical Stock Photo. in wild animals, particularly skunks, raccoons, bats, foxes, groundhogs, and rodents. Rarely is rabies transmitted to people, but people who have been bitten by rabid animals need to get immediate treatment before the infection begins, or they may die. Deaths are rare, however: between 1990 and 1995, only 18 people died of rabies in the United States. Household pets, such as dogs and cats, cause the majority of animal bites in the United States, and most bites are from animals known to the person bitten. Dog bites usually occur on the hands, face, or legs. About a million people a year seek medical care for dog bites in the United States, and millions more bites are unreported. Sixty percent of those bitten are children, so dog bites are a major health problem of children. Dog bites rarely become infected, and rabies in dogs is rare. On average, 12 people, mostly young children, die each year from dog bites. Not running away from a growling dog, but instead backing away very slowly or waiting calmly for the dog to leave. Cat bites and scratches also are very common, and they are more likely than dog bites to become infected. Cat bites most often involve the hands, followed by the legs, face, and torso. Rabies is rare in cats, but it is more common in cats than in dogs. One infection caused by cat bites or cat scratches is called Cat Scratch Disease. It causes enlargement of the lymph nodes * but usually goes away by itself after about three weeks. Human bites are dangerous because the human mouth contains bacteria that can cause serious infection. The most common human bite wound is a "fight bite," one that occurs when one person punches another person and cuts his knuckles on his opponent's teeth. Children sometimes bite other children or adults, and these wounds result from skin being caught between the teeth. The situation can be made worse when people are embarrassed about the bite and do not see a doctor right away, because delay in treatment can allow an infection to develop. * lymph node is a round mass of tissue that contains immune cells that fight harmful microorganisms. Lymph nodes may become enlarged during infections. Mice, rats, guinea pigs, and hamsters sometimes bite, as do exotic pets such as ferrets, snakes, and birds. Horses, mules, sheep, pigs, and goats also can bite. Wild animals like skunks, raccoons, and bats bite thousands of people each year, and these bites can be very dangerous because the animals might have rabies. Wild or wounded animals should never be approached. If a wild animal that usually avoids people instead starts to approach or to seem friendly, it may be sick. An adult should be notified about a sick animal right away. They should call police or park rangers or animal control officers who have been trained to handle sick and injured animals. All bites should be cleaned as soon as possible. If the skin is broken but not torn or bleeding, the wound should be washed with soap and water and treated with antibiotic cream to prevent infection. If the bite is a puncture wound or is bleeding, pressure should be applied to stop the bleeding. In all cases, the wound should be examined by a doctor, who may recommend antibiotics, as well as a tetanus shot if the person has not had one in the last 10 years. 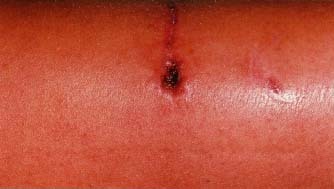 A person with a bite wound should watch for signs of infection, such as redness, swelling, and tenderness around the wound site. If any of these symptoms appear, they should see a doctor immediately. American College of Emergency Physicians (ACEP), 111 19th Street NW, Suite 650, Washington, DC 20036. American Veterinary Medical Association (AVMA), 1931 North Meacham Road, Suite 100, Schaumburg, IL 60173.